Not long ago, Crelate was named the “Most Implementable” applicant tracking system (ATS) in the G2 Crowd Implementability Index. This is great for businesses that want to get up and running quickly or need to transition to more capable software without slowing business growth. But what exactly does this rating mean for businesses looking to adopt a new ATS or upgrade their existing system? Applicant tracking and customer relationship management (CRM) systems are major cogs in the machinery of staffing and recruiting. So, naturally, there’s some trepidation around implementing or switching to a new ATS and CRM system, since the setup process can be disruptive or risky to business. There are likely some factors specific to your business that need to be weighed before a decision is made. However, user-reported metrics are probably the best way to evaluate how quickly a new system will meld with your business. G2 Crowd gathered a wealth of user-reported data and created their Implementation Index to provide businesses with exactly the sort of data they need to get past that implementation hurtle, and confidently identify which applicant tracking system will be the easiest to put to use. G2 Crowd is an independent company that collects, aggregates, and analyzes user review data for business solutions like Crelate. G2 Crowd provides ratings based on user feedback to help businesses find the best tools for them. To help clarify what the “Most Implementable” award means for talent management firms, here’s what we learned about Crelate from G2 Crowd’s Implementability Index. 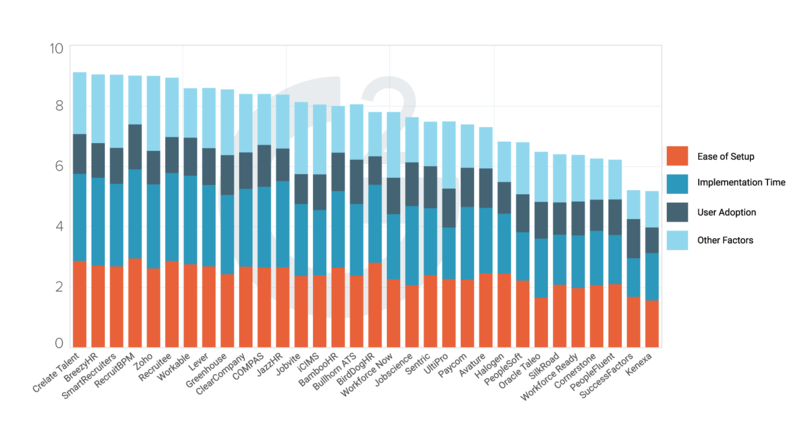 Crelate, located on the far left of the graph, ranked in the top three for every aspect of implementation that G2 Crowd measured. G2 Crowd used an algorithm to aggregate all the variables into a single rating. This implementation rating gives an overall picture of how easy it would be for a company to implement each applicant tracking system. This rating takes into account how long it takes the software to go live, how the system is implemented, and how many users adopted the system after trying it. So, even though Crelate didn’t rank number one in every aspect of implementation, based on customer feedback, the overall experience of implementing Crelate into your business will be the easiest of any applicant tracking system on the market. G2 Crowd also examined which businesses each applicant tracking system primarily serves. They segmented customers into businesses with 50 or fewer employees (small businesses), businesses with 51-1000 employees (mid-market), and businesses with over 1000 employees (enterprise). 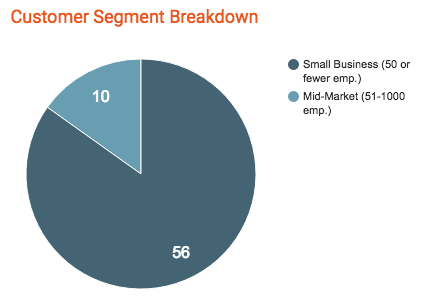 As shown on the graph, Crelate’s customers are small and mid-market businesses. Crelate specializes in providing these segments of the staffing and recruiting industry with powerful software they can use to run—and grow—their businesses. This is important, because the needs and resources of these customers differ from large enterprises. The Crelate team has done a lot of work to reduce the effort required to get up and running; something growing companies need most. The dispersion of small businesses and mid-market businesses in Crelate’s customer base also indicates that Crelate’s system is much more than an entry level ATS. Crelate is software that will scale with business growth, and will serve businesses well as they add clients and team members. This capability, coupled with Crelate’s overall ease of implementation, makes Crelate the best solution for any business looking to expand their operations and improve their efficiency by adopting a better ATS. Crelate’s lightweight implementation process will have the most minimal impact on operations. The setup expenses of an applicant tracking system are part of the overall cost of the software and go into any Total Cost of Ownership calculation. There’s a high upfront cost for any software that requires an external team to implement. Crelate customers rated the ease of setup with their in-house team at 96%. This is far better than the average ease-of-setup score of 80%. Additionally, the majority of customers were able to implement Crelate using their in-house team, and Crelate never requires a third party consultant to get the system online. This means that the capital investment and external support businesses need in order to start working with Crelate is lower, and more friendly for growing small and mid-market businesses. G2 Crowd measured the implementation time in months, and many of the applicant tracking systems required several months to get online. However, Crelate clocked in well below the industry average at just under two weeks to start working for businesses. This means that there will be hardly any lag time between when businesses decide to implement Crelate, and when they can start using Crelate to run their operations. This is critical for Crelate’s primary customers—small and mid-market businesses—since it’s important for those expanding companies to maintain their momentum as they grow. Crelate’s customers also gave their ratings to G2 Crowd for satisfaction with the service. According to Crelate’s customers, Crelate is one of the best applicant tracking systems on the market. Rated at 4.6 out of 5 stars, no other applicant tracking system received a higher customer satisfaction score than Crelate. This means that with less than two weeks of implementation using an in-house team, staffing and recruiting firms can start running their business with one of the highest customer-rated applicant tracking systems on the market. According to G2 Crowd, Crelate has smartly addressed one of the major pain points for small and mid-market recruiting and staffing firms looking for an applicant tracking system. 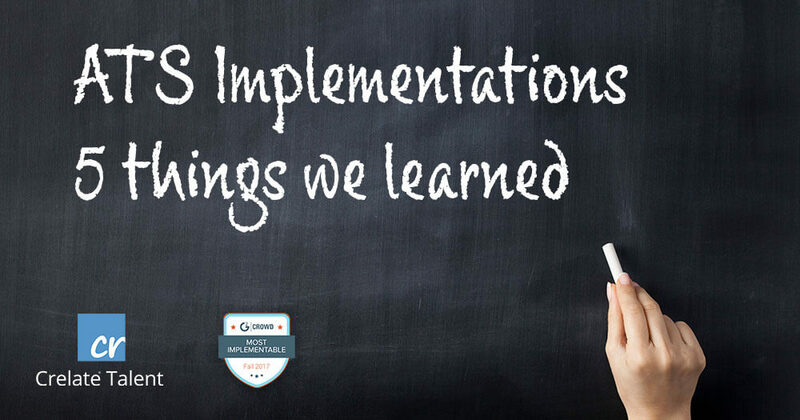 The implementation process for an integral system can sap time and resources that growing companies don’t have to spare. Crelate’s position as the most implementable applicant tracking system makes them the best option for those companies that need to upgrade their software to fit their expanding client bases without getting mired in a transitional phase. Click here to see the full G2 Crowd Implementation Index for Applicant Tracking Solutions.